aniel, during the stage of his life described herein, is a young, discrete, mild-mannered bookkeeper by day but an intrepid explorer of consciousness by night and on weekends. He also possesses a highly refined sensibility and an abiding passion for art and music. In this collection of true tales, akin to prose poems, he recounts a series of experiments he undertook over a two-year period that combined his aesthetic and consciousness-modulation interests: twelve psychedelically mediated visits to a range of New York museums, galleries and concert halls to encounter specific collections, shows, installations, and musical performances. 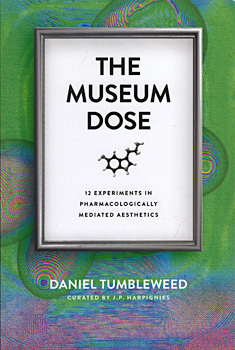 Drawing from his substantial knowledge of the cutting edge of the contemporary underground mind-altering pharmacopeia, he carefully selected a different molecular compound and the ideal dosage (the "museum dose") to heighten each of these experiences. This text is riveting because Daniel's open-hearted temperament combined with the drug-induced raw emotional states and heightened perceptions permitted him to let the art he encountered trigger deeply visceral soul searching and some extraordinary transcendental moments, all of which he describes beautifully. He also vividly captures the flows and paradoxes of life in New York City, a major protagonist throughout, and he is a keen observer of contemporary mores. This book is in many ways profoundly unfashionable: there is no hint of irony here. This is a young man sincerely wrestling with the deepest questions, seeking to open his mind and his heart and find his way in life, and if you open your mind and heart to this young new writer's exciting debut, you will be moved and transported, whatever your feelings about his admittedly unconventional method.